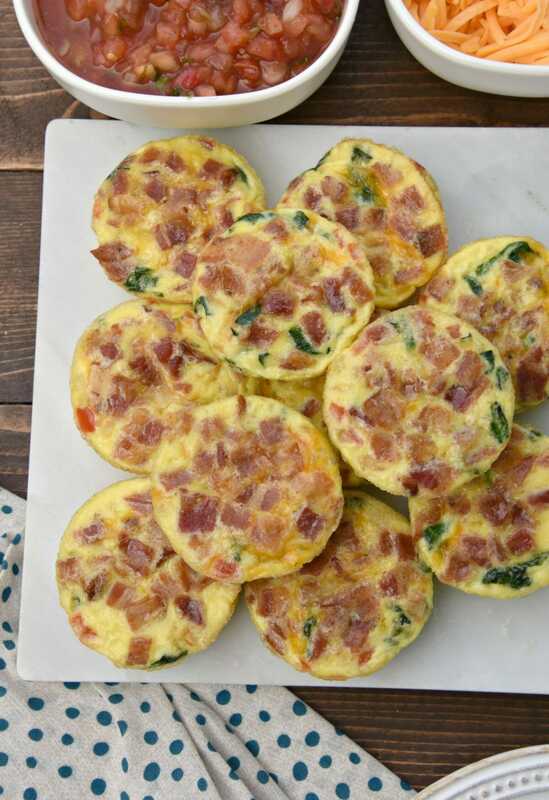 These bacon and spinach egg muffins will make your morning easier! Prepare these ahead of time and microwave for a quick meal on the run. Okay, so these aren’t exactly your traditional muffin. If you’re looking for those check out these banana muffins, peach muffins or lemon poppyseed muffins. 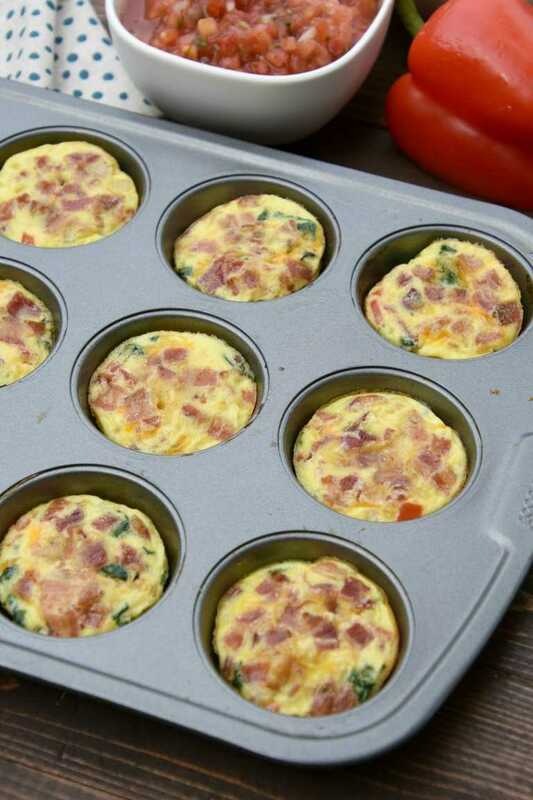 These egg muffins are more like scrambled egg cups or mini frittatas, but my kids love when I call them egg muffins. In fact, my kids just love these egg muffins no matter what I call them. I even chopped these up for my baby and he couldn’t get enough! I love that it’s so easy to serve a warm breakfast that everyone likes and they’re also healthy, so that’s an added bonus. You can serve these immediately or make these egg muffins a day or two ahead of time and keep chilled in the fridge until it’s time for breakfast. It just takes a quick 30-45 seconds in the microwave to heat them back up and you have a healthy breakfast on the go. Serve these with salsa or hot sauce on top for the perfect breakfast. 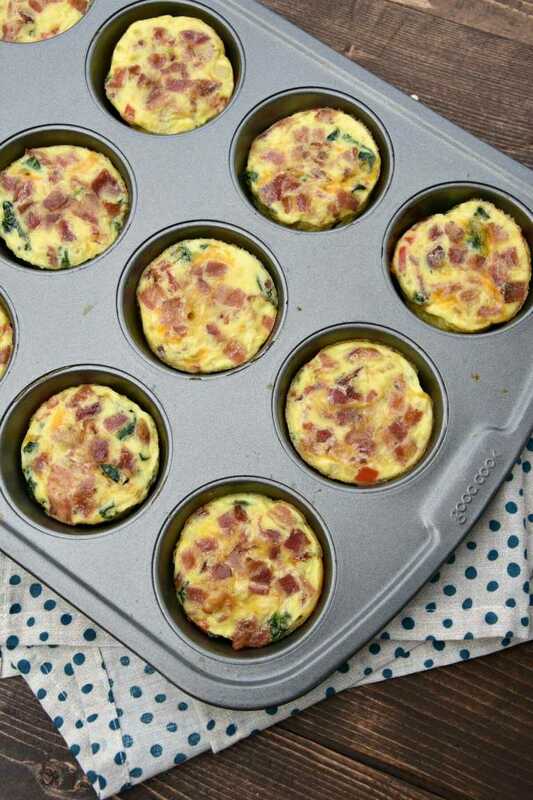 One of my favorite things about these egg muffins is that they are totally customizable. You can add whatever veggies you have in your fridge that you like to eat with scrambled eggs. Enjoy! Preheat oven to 375 degrees F. Coat 12 muffin tins with non-stick cooking spray. In a medium bowl add the eggs and milk and whisk well. Season with salt and pepper, to taste. Heat a skillet over medium high heat and generously spray with non-stick cooking spray. Add onion and bell pepper and cook for 5-6 minutes until tender and onions are translucent. Add spinach and cook until wilted, about 1 minute. Remove from heat and divide veggies into the prepared muffin tin. Pour eggs in each cup over the veggies and fill 2/3 of the way full. Sprinkle with cheese and cooked bacon. Cook in preheated oven for 12-15 minutes, or until eggs are set. Happy September! It’s National bacon day today so our celebrating food group came up with some mouthwatering bacon recipes to share with you today!